Photran is an IDE and refactoring tool for Fortran based on Eclipse and the CDT. Photran 9.1 was released with Eclipse 4.5 (Mars) on June 24, 2015. * A project must explicitly have analysis support enabled for these features to work. See the Photran documentation for more information. 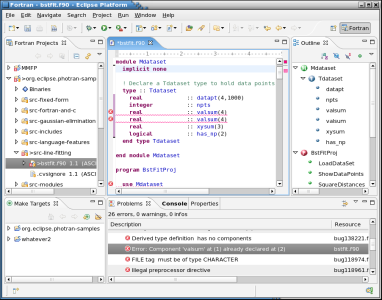 Photran is a component of the Eclipse Parallel Tools Platform (PTP).